The following blog post was a submission in the 2nd Annual Shorty Social Good Awards. Good360 is honored to accept the award of finalist for this entry in the Emergency Relief category. We are proud of the work we have done with our partners RH, Tempur-Sealy, and The UPS Foundation. Imagine sitting in your living room, watching television with your family one summer evening when water begins pouring in under the doors at an alarming rate. This was the experience of Aimee G. in Lafayette, Louisiana in August 2016. Thankfully, she and her family evacuated safely. But they lost everything else. As record-breaking amounts of rain continued to fall, the flood waters continued to rise. This historic storm took 13 lives, led to over 30,000 water rescues and damaged or destroyed more than 149,000 homes. Nearly a year after the disaster, thousands of families were still displaced and waiting on home repairs. Good360’s key goal was to help bring some of those families back to a place of resiliency. As the global leader in product philanthropy and purposeful giving, Good360 transforms lives by providing hope, dignity, and a sense of renewed possibility to individuals, families, and communities impacted by disasters or other challenging life circumstances. To help serve the impacted Lafayette community, Good360 galvanized the support of key partners to address the long-term recovery needs of a community devastated by catastrophic flooding nearly o ne year earlier. Move families back into cleaned up and rebuilt homes. Leave those families in a state of improved resiliency, better equipped to handle future disasters. Speed up the overall recovery of the region. Deliver hope and dignity to a disaster-impacted region all but forgotten by the media. More than 80% of donations occur within two weeks post-disaster, neglecting long-term recovery and rebuilding. The situation in Louisiana was exacerbated because this flood was caused by an unnamed storm and occurred when election-centric stories dominated the air waves. Typically, responding nonprofits would have been able to raise millions of dollars, but with a lack of media coverage, they raised only thousands. Good360 reassessed the needs of the community nearly a year after the initial disaster to determine the best approach to help. Research shows that up to 60% of goods donated during times of disaster end up in landfills because they are not the right goods at the right time. Good360 works directly with responding organizations on the ground in the impacted area so that we know exactly what is needed. In Lafayette, a formal case management process identified what items were needed, ensuring maximum impact. Good360’s work in Louisiana was made possible by the support of important partners, both nonprofits as well as corporations. Mississippi-based nonprofit Eight Days of Hope was undertaking an initiative to clean up and repair approximately 150 impacted homes in the region, and this provided Good360 with an effective way to distribute needed goods to those families. Furniture was identified as a core need and Good360 mobilized socially responsible corporate partners like leading luxury home furnishings company, RH (Restoration Hardware) and Tempur-Sealy, the world’s largest bedding provider. The UPS Foundation also provided shipping support to move the goods into the area. Like many of our nonprofit partners, we always strive to give a hand up, not just a hand-out. Our product donations not only fill a practical need, but also reinstate a sense of pride and confidence. A table is not just a piece of furniture, but a place where a family can come together for meals and conversation, building and reinforcing bonds. 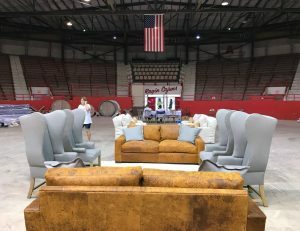 In Lafayette, families were paired with an Eight Days of Hope volunteer team leader and an RH designer to help select the most appropriate pieces for their homes, imbuing the entire experience with compassion and dignity. Not only did flood victims get a hand up on the rebuilding journey, but our partners’ product contributions were tracked to their specific destinations with all details tying back to the case management process described above. Good360 provides metrics and impact stories to donors highlight the impact of donations on recovering communities. 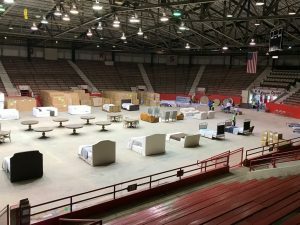 10 semi-truckloads representing $1.054 million in critically needed furnishings and home goods secured to support flood victims in the Lafayette, Louisiana area. More than 500 pieces of furniture and home goods distributed in 3 days in order to refurnish 60+ homes. 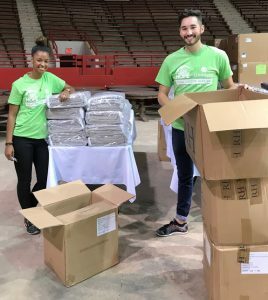 Items were staged in a long-term recovery warehouse to distribute to up to 70 additional homes as they are rebuilt over the next six months. Orchestrated effective collaboration between numerous partners, including 27 Louisiana-based nonprofits and three corporations. Amplified donated funds by a ratio of 1:35, meaning that for every dollar donated, Good360 distributed $35 in goods. While we helped many families, and accelerated the recovery process significantly, Good360 is still working in the region to rebuild and refurnish homes and will continue to support Southern Louisiana for months and years to come.